Description: OpenSS7 Hardware Selection CPC388. 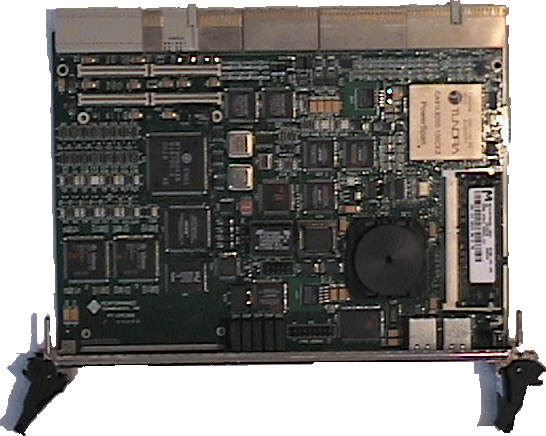 The CPC 388 cards are 8-span E1/T1/J1 cards with dual-port Ethernet in a CompactPCI PICMG 2.16 card manufactured by Performance Technologies, Inc. The figure below shows a picture of a CPC 388 card (without rear transition module). The CPC 388 cards have a high level of signalling performance because they have an on-board PowerQUICC II processor running an embedded Linux operating system (NexusWare based on YellowDog). The embedded processor performs Layer 2 (HDLC) and even some Layer 3 functions and higher functions. These cards run as stand-alone hosts or can transfer to a host SBC over the PICMG 2.16 dual Ethernet bus or CompactPCI bus. OpenSS7 STREAMS drivers and modules, as well as complete applications can be run directly on the card. The CPC 388 cards have an integral H.110 bus and TDM switch that communicate over the PICMG 2.16 TDM bus. This provides for non-blocking switching of up to 4096 TDM channels across the backplane. In E1 mode (and with an E1 RTM), these cards provide 248 channels of SS7, ISDN or voice. In T1 or J1 mode, these cards each provide 192 channels of SS7, ISDN or voice. The CPC 388 cards accept the same softwarea s the PCI 384 cards (and dual T3 CPC 396 cards) providing a carrier-grade evolution path from the PCI 384. Provides STREAMS Media Gateway (MG) Interface that controls onboard TDM switch and H.110 bus. Provides Soft-HDLC for Q.703 and Q.703 Annex B operation. Provides G.804/AF-PHY-00016 ATM/PDH E1 or T1 SAAL. Octal E1/T1/J1 (requires apporpriate RTM). Mitel/Zarlink MT 20098 H.110 switch. Dual FCC 10/100baseT Ethernet Ports (RTM RJ-45 or J5 connector). 200MHz Motorola PowerQUICC II (MPC8260) processor. Runs NexusWare embedded Linux operating system. Individual E1/T1/J1 status LEDs on front panel. Hot swappable (per PICMG 2.16). NEBS Compliant (lights on front, wires on back). Note: Some of the information in this hardware selection guide may be incomplete, incorrect, out of date, or inconsistent with the vendor's actual offerings. Also note that this hardware selection guide does not constitute an endorsement of anyone's product or service. The authors of the OpenSS7, their sponsors, agents and representatives will not take responsibility in it. Please use good business sense when considering any vendor's products and consult with the individual vendor before making any decisions. Please do, however, investigate the product and service offerings of the sponsors listed on our Sponsors page: it is through your support of our sponsors that the OpenSS7 Project exists and is funded to continue.